"The Earth is blue like an orange"
is the first line of a poem by French surrealist poet Paul Éluard, whose birthday was yesterday. Éluard, born Eugène Émile Paul Grindel, was one of the founders of the Surrealist movement in France, but broke from the group when he joined the Communist Party. See the entire poem in its original French, and in English, here, thanks to the University of Toronto. 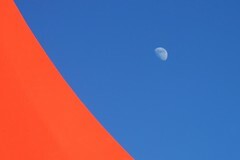 The image above is a photograph entitled "Moonrise over Calder" and was taken by Piero Sierra and posted on Flickr. Very beautiful is that blue sky , the beauty we artists try and recreate. That blue is electric with conciousness. P i n k M e - has moved!